Elizabeth Bear returns to the sorcerer Abigail Irene and the wampyr Sebastian in this follow up to her linked collection New Amsterdam. 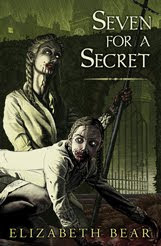 Seven for a Secret is a novella which is set near the end of Abby Irene’s life. Her exile from England is at an end and she now resides in a much changed London. London is an occupied city in 1938, with the Prussian Army having been victorious in the last war. Abby Irene is now in her 80’s, but in Seven for a Secret she isn’t the protagonist of the story. There are two real storylines working in Seven for a Secret. The first is of two teenaged girls, Prussian soldiers who are called “Sevens”. They are given great responsibility for their age because of what they will be able to do in the future. At the start of the story it is not clear exactly what that may be. The other storyline mostly centers around Sebastian as he investigates why these two girls give off a scent similar to werewolves – even though werewolves shouldn’t exist any longer. At least not in London. Seven for a Secret touches on loss and memory, on being the resistance in an occupied city, and on how governments might use supernatural elements. It’s a story of young girls, an old woman, and an even older vampire. Moreso than in New Amsterdam, Elizabeth Bear will try to break your heart. Seven for a Secret is laced with emotion and loss. Those who remember the character as a much younger and spry woman will mourn for the loss of youth, but readers can jump in here and find their own way to a broken heart. The two Prussian girls, Ruth and Adele, opens up an entirely different aspect to this alternate history and it is brutal. Sebastian looking at Abby Irene will do it, but so will Sebastian understanding what the girls will face in the future. Let me just put it this way: Seven for a Secret is really good. I wrote about New Amsterdam last year, but this is so much better and it screams out for a re-read. Seven for a Secret also begs for a sequel. Bear is at work on a novella called The White City, but that’s a story set before the New Amsterdam tales. I want to know more about Ruth and Adele and how that all works out. Bear does well to leave the reader wanting more, but damnit, I want more.